In Colorado and Southern dark green with metal details, full interior and metal wheels. NEW ! Code 332 brass track in 10′ curve. New! Code 332 brass 9′ diameter curve track to go with your 6′ flex pieces. life has never got so easy! Five foot length of code 250 track with the narrow gauge ties. Flexible ties enable you to make your own configuration. You know you need this! How else are you going to get your cattle to market? In brown with Canadian National lettering. This is the track that you outside layout people need! A BIG 6 feet in length! It curves easily in either direction by hand. Great for large majestic curves. Just fasten it down to maintain shape. Save money making whatever large curve you desire. A large caboose in a large 1/20 scale. Fully detailed with working marker lamps and metal handrails and ladders. You need this beautiful gondola! Big 1/20 Scale with the same details as their flat cars. 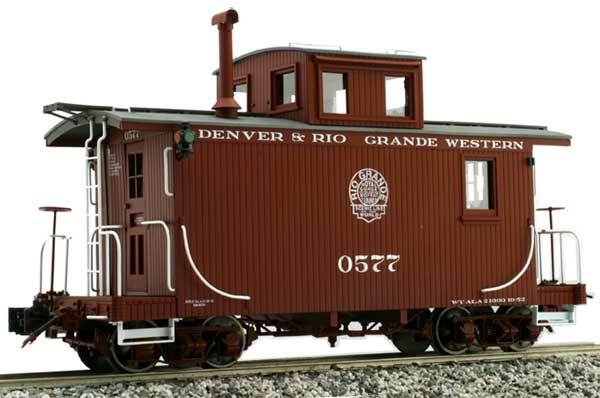 The Denver and Rio Grande Railroad would be proud to have this on their Presidents desk.